Today, April 2, has been designated as World Autism Awareness Day by the United Nations in a resolution passed in 2007. Other organizations have designated the entire month of April as Autism Awareness Month. Those of us who are #ActuallyAutistic have found much of this language problematic because the issue isn’t as much awareness but acceptance, making sure autistic children, teenagers, and adults have a safe environment, one free from bullying and exploitation, and we receive the support we need to thrive in school, workplaces, and society in general. A related issue is the nature of organizations that claim to support autistic individuals. Do those organizations have autistic people in leadership positions? “Nothing about us without us” is an important principle to keep in mind. As a writer and activist for the full inclusion of autistic creators in the publishing industry, I’ve been encouraged by the efforts of We Need Diverse Books and others to push the industry toward more and better portrayals of indigenous people and people of color in books for children and teens, and to make sure #ownvoices creators aren’t chronically passed over for limited slots. While sensitivity readers can help with more accurate and complex portrayals, hiring a sensitivity reader is no substitute for giving marginalized authors and artists the chance to tell their stories. I’ve noticed, however, that disabled and neurodiverse book creators are still struggling to break in and maintain careers. It concerns me because not only am I one of those neurodiverse authors but also in many ways, people with disabilities are canaries in the coal mine, and impatience with us or exclusion of us is a harbinger of how other marginalized people will soon be treated. This message was driven home to me a couple of weeks ago when I saw the Academy Award-nominated foreign language film Never Look Away. Loosely based on the life of painter and sculptor Gerhard Richter, the film traces the life of the young artist Kurt Barnert (the fictionalized Richter) from his early years growing up in Nazi Germany to his education in Communist East Germany after the war and his escape to the West, where he returned to art school and rebuilt his career in a climate of what was to him unimaginable freedom. Kurt’s interest in art was nurtured by an aunt who showed signs of mental illness and who, under the Nazis’ draconian policies toward persons with disabilities was institutionalized, sterilized, and ultimately murdered. As the United States Holocaust Memorial Museum states, “The most extreme measure, the Euthanasia Program, was in itself a rehearsal for Nazi Germany’s broader genocidal policies.” People like Elisabeth in Never Look Away — and Richter’s young aunt in reality — were the canaries in the coal mine, their torture and mass murder preceding that of Jews, Roma, LGBTQ persons, and others. 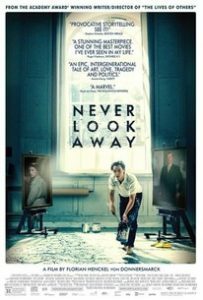 Never Look Away‘s director, the immensely talented Florian Henckel von Donnersmarck (writer/director of the Academy Award-winning Cold War drama The Lives of Others) juxtaposes Elisabeth’s humanity with the cold brutality of the doctor who condemned her to her fate. The oily Dr. Seeband, who manages to rise to the top under the Nazis, the communists, and the capitalists as oil usually does, is the father of Kurt’s girlfriend, also named Elisabeth but nicknamed Elly. Dr. Seeband torments the couple, even maiming his own daughter to prevent her from procreating with someone who has mental illness in his family. In totalitarian societies, entire families paid the price when one member didn’t conform. 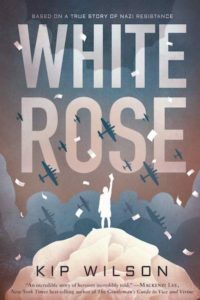 Shortly after watching Never Look Away, I read Kip Wilson’s powerful verse novel White Rose, the story of Sophie Scholl and the other members of this courageous but doomed student organization that circulated leaflets telling the truth about the Nazis, their genocidal policies, and the massive casualties their troops had sustained on multiple war fronts. Along with observations of Jewish friends and neighbors losing their businesses in the days before the war, Sophie sees a printed sermon by Bishop August von Galen — also circulated illegally and serving as an inspiration for the White Rose: “I have been informed / that hospitals in Berlin are preparing / lists of inmates who are classified / as unproductive members / of the national community / and that these people are to be removed / from these establishments and killed” (p. 101). And after reading the sermon, Sophie notices Jews in her town forced to wear the yellow star, then, “deported — / first to Stuttgart / then out of Germany / entirely” (p. 106). 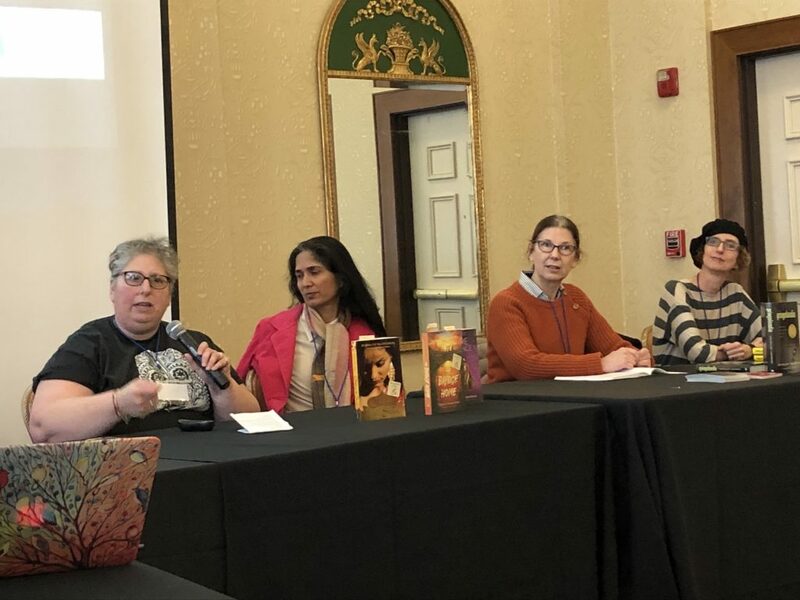 I had the privilege to present on a panel at Kidlitcon last week with Kip and Padma Venkatraman, whose middle grade novel The Bridge Home includes the protagonist’s disabled sister — and the sister plays an important role in supporting the “found family” at the heart of the story. 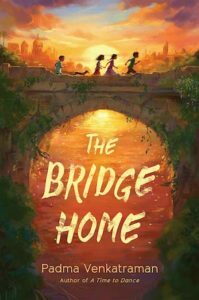 Set in Chennai, India, where Padma grew up, The Bridge Home shows how a group thrives when it uses the skills of everyone rather than excluding those who are different and perceived as weaker. 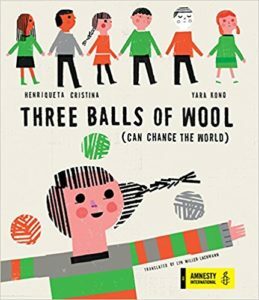 Though predatory adults eventually do harm to the brave and kind children, Viji, Rukku, Muthu, and Arul carry the dreams of a better world, one based on inclusion, trust, and mutual respect. I thank Padma, Kip, and moderator Dr. Laura Jimenez (a member of the We Are KidLit collective) for including me on the panel and our lovely audience for listening and participating. I went home from Kidlitcon heartened and encouraged in my own quest to tell my stories, for if the canaries survive and thrive in the mines, what jewels will we all discover there? The Kidlitcon panel on social justice literature, from left Dr. Laura Jimenez, Padma Venkatraman, me, Kip Wilson. Photo by Ellen Mayer, used with permission. Great seeing you on the panel, Lyn. And what an excellent post. Loved that last question. So lyrical. Thank you, Linda! It was a great panel, and Kidlitcon is one of my favorite conferences. Manageable size and engaged participants.